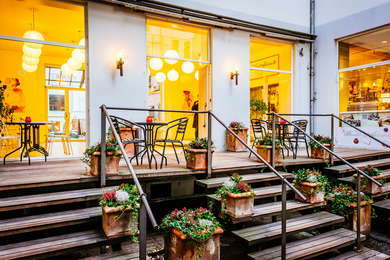 While Copenhagen Airport is an easy trip from the center of town (15-20 minutes on the metro), this hotel is a cut-above the standard airport crashpad. Efficient staff, large rooms, and views across the airport to the sea make it a more pleasant choice. It has good meeting and conference facilties too, plus, the trains don't run all hours and you don't even need to go outside to reach Terminal 3 of the airport - a bonus in winter. The spa is great, too, although guests do have to pay extra. Rooms are reasonably sized and amazingly quiet considering how close they are to the airport. Beds are also large, and comfortable. Even standard rooms have desks. Bathrooms are spacious too, with double sinks and a shower and bath in all of the rooms. The lobby is large and bright, if a little corporate. YOU SHOULD KNOW Service can sometimes be a bit hit-or-miss, particularly in the restaurant. The heated saltwater pool is lovely, part of the Ni'mat Spa on-site at the hotel. The spa is half-price for guests (125 DK compared to 250 DK), and has a comprehensive and relaxing offer - six treatment rooms and an aroma steam room. Most weekdays it only opens from 3pm, although it is open at weekends from 10am. The well-appointed gym is free for guests and 24/7. Staff can also guide guests on outdoor running routes, including some gorgeous trails along the nearby beach. The breakfast spread is comprehensive: try the pancakes. The restaurant offers solid international options, with a new restaurant concept called Kitchen & Table due to open in autumn. The large bar to the side of the lobby has a slightly bland international feel, as you'd expect from an airport hotel, but it can be buzzy when there are enough guests in town. The hotel is right by the airport's metro stop, and obviously it's pretty well connected internationally, too. All of the airport terminals are within walking distance. Cafe Le Perr (15-minute walk) is a local restaurant with great food and a welcoming atmosphere. Or head into town and make the trip worth it at Marv & Ben (22-minute metro trip), a storming restaurant specialising in Nordic gastronomy with a great atmosphere. For drinking options, you're best to head into Copenhagen itself - try the classy cocktail bar, Holmens Kanal (15-minute metro tip), that's close to Kongens Nytorv. Or for craft beer, Mikkeller Bar (20-minutes by train). A solid airport hotel with larger than average rooms and good business facilties. For early or late flights or stopovers, it's a better-than-average bet, and the spa is not bad either.